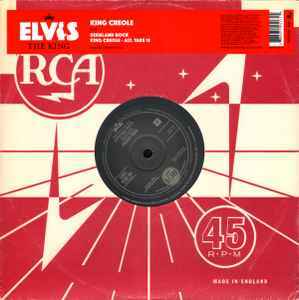 9th single in '18 Of The Greatest Singles Ever' which are part of the Elvis The King series of single reissues. This compilation ℗ & © 2007 Sony BMG Music Entertainment (UK) Limited. Songs A. published by Carlin Music Corp. ℗ 2003 Sony BMG Music Entertainment. B1. Carlin Music Corp./Minder Music Ltd ℗ Recorded prior to 1972 Sony BMG Music Entertainment. B2. Carlin Music Corp. ℗ Recorded prior to 1972 Sony BMG Music Entertainment. The enclosed record graphics are simulated to reflect the original issues. While every effort is made to replicate artwork, some original logos, labels and wording have been changed for legal reasons. Elvis and Elvis Presley are registered trademarks of Elvis Presley Enterprises Inc. All rights reserved. The RCA Records label is a unit of Sony BMG Music Entertainment. RCA is a registered trademark. RCA trademark management S.A. Replica die cut cover: Made in England. Master Recording of Radio Corporation of America.